Sometimes called the ‘bible’ of American Brilliant cut glass, this is an important book for your reference library! This book is of great value to collectors and dealers of all levels; we recommend it highly. This is the third and most current edition and contains an updated price list and a list of 88 pattern identifications that have been made since the book was first published in 1986. 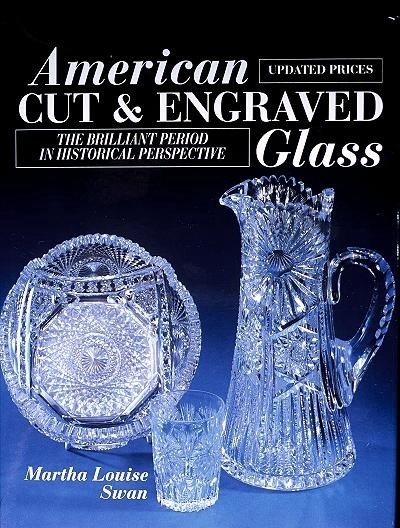 ‘American Cut and Engraved Glass: The Brilliant Period in Historical Perspective’ contains — in a single volume — a complete history of cut glass and its manufacturers (both U.S. and Canadian), up-to-date information on identifying designs, and current prices for the more than 650 items pictured. Collectors who admire the cut and engraved glass of America’s Brilliant Period (1876-1916), but lack the expertise to judge the authenticity and value of these beautiful antiques, will not want to be without this definitive guide. Dealers and experts in this field will find the 500 black-and-white photos, eight pages of color, and dozens of illustrations invaluable. The price guide is now bound into the book, and is also sold separately. You’ll learn how to identify motifs and designs, recognize fine quality workmanship, determine age, and differentiate between American and foreign ware. An index to illustrated patterns and designs, American and Canadian marks section, general index, and bibliography make this highly readable volume an ever-timely, permanent addition to your reference library. Martha Louise Swan’s scholarly research and evocative treatment of the Gilded Era make fascinating reading. She has been collecting cut glass since 1967 and first published ‘American Cut and Engraved Glass of the Brilliant Period’ (Wallace-Homestead) in 1986. It has since become the definitive guide to American cut glass.